This is a gorgeous space, with original hardwood floor, original wall woodwork, and the most majestic historic stain-glass window, overlooking the Main Hall. This space can be rented for your romantic Valentine's day or the private gathering of up to 20 people, when you want to really impress your guests. The space can be rented for $500 for up to 4 hours, and $100 per additional hour. There is a 10% discount for weekday events. Rental fee is $600 for weekends for up to 6 hours, and $100 per hour after the 6 hours. A 10% discount applies to weekdays. 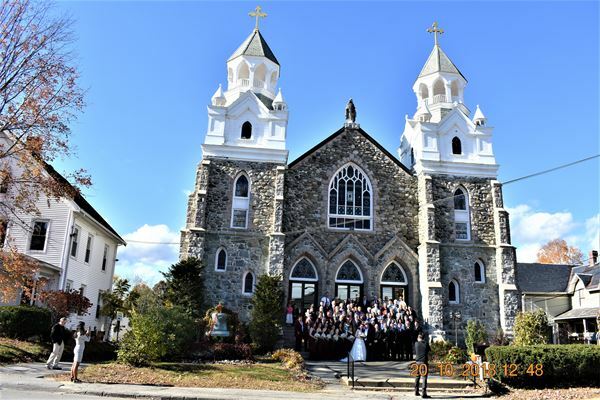 Rental includes: Rental of the First Floor Ballroom for up to 6 Hours (including set-up and clean-up), Upscale seating for up to 160 guests (gold chiavari chairs and Maine wood banquet tables), Plenty of onsite Parking. Please contact us for additional information. Please contact us for complete terms and conditions, including corporate rate and rental fee for recurring events. Rental of the Main Hall for up to 4 Hours (including set-up and clean-up) Plenty of on-site parking If rented for a wedding ceremony, Bell ceremony will be included at no extra charge, when weather permits. Monday - Thursday • $800 for 4 hours • $125 per additional hour Friday - Saturday • $1000 for 4 hours • $150 per additional hour Please contact us for additional information. The balcony is ideal for the bride's party and also provides a bride’s dressing room. It can be also rented separately for your small private gatherings of up to 20 people when you mean to truly impress your guests! The First Floor Ballroom is a charming and spacious hall, with great ambiance, 12 feet high ceilings, custom lighting, vintage wall art, and simple elegant stain-glass windows. The Ballroom sits up to 300 guests and can be rented for a variety of events such as Holiday Parties, wedding receptions, birthdays, graduation parties, corporate events, celebration of life, and more. The space comes with classy handmade Maine wood banquet tables, and attractive gold Chiavari chairs for up to 160 guests, at no extra costs, to make your reception truly exceptional and unforgettable. The Main Hall with the gothic revival architecture, majestic Roman columns, splendid stain-glass windows, 30-feet high ceiling, vintage pews, original vintage woodwork, incredible acoustics, and the long aisle walked by so many brides, is the perfect venue for the dream wedding ceremony, and any other gathering of that magnitude, such as celebration of life, musical or theatrical performances, and more. The majestic exterior provides a sense of a Royal Manor or Castle, with unparalleled opportunities to photographically immortalize the fairy-tale moments. Atmosphere/Decor: Classic, with historic ambiance. Special Features: Grand exterior, historic ambiance, magnificent Main Hall, spacious first floor Ballroom, historic stain glass windows, the original pews & woodwork, and majestic balcony, alongside modern safety and accessibility amenities.